When I was a young boy in real life I had a fascination with robots of all kinds. I had many a robot wind up toy, and of course I loved droids from the star wars movie. I liked the Cylons from the original Battle Star Galactica almost more than the heroes of the series. 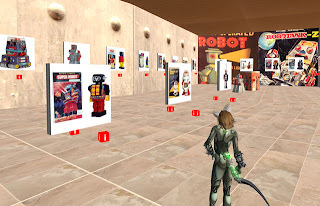 So, when I was shown "The Museum of Robots" I was very excited to share it with you. I quickly wished myself into my android (a type of robot) form and went about exploring. 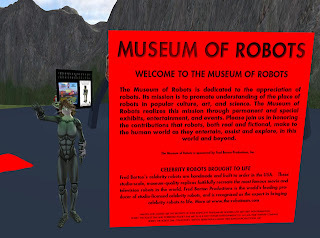 The Museum is dedicate d to all manner of robots, including vintage robots like "Robby the Robot" and "Tabor the Great" as well as more modern versions like the "T-101 Terminator" and "Cylon Centurion". There are also a few vintage movie clips available of old black and white movies where robots were the main plot device. Outside is a gallery devoted to entries in Robot build contests. Most are very well made, some comical and some serious. 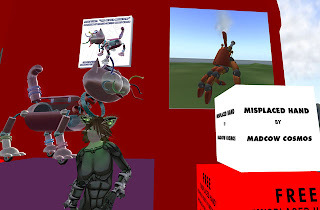 Up on the third floor of the main museum building is the obligatory shop where some of the robot designs from the contests are available for purchase. Of note, the coolest one in my opinion, a robotic steam punk hand, is a freebie. 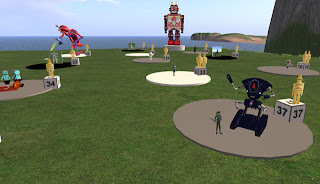 There is more to see at the Museum of Robots, including an exhibit dedicated to a man who makes robot shapes out of every day items such as teapots, refrigerators, and other household items. I did not have the time to fully explore, so go there and let me know what I missed out on!! Wow! What a wonderful place! Errrr... only thing... i remember most of the films in the museum section... thankfully some of them from repeats! The films are neat, mostly trailers which do tell you about the films. The Day the Earth Stood Still, with Gort, has been one of my favorite films of all time, and one that i think should be required viewing! Well worth visiting the museum, thanks for letting us know about it!